Last weekend Joan and I had the chance to take the bikes out for a ride. It was a great day with temps in the low 50’s and nothing but blue sky overhead. We rode into Henderson, grabbed some lunch and picked up a few things to include in some birthday gifts. Joan's son Sean and my youngest son Chris both celebrate birthdays in January. Happy Birthday guys. Last week we officially started our new jobs as volunteers in Lake Mead NRA. The National Park Service has 2 small campgrounds located at Echo Bay; the lower campground is smaller with about 40 sites located about 400 yards from Lake Mead, while the upper campground where we’re set up are about a ¼ mile further up the hill has 4 loops with approximately 150 sites. We are considered maintenance, not camphosts. 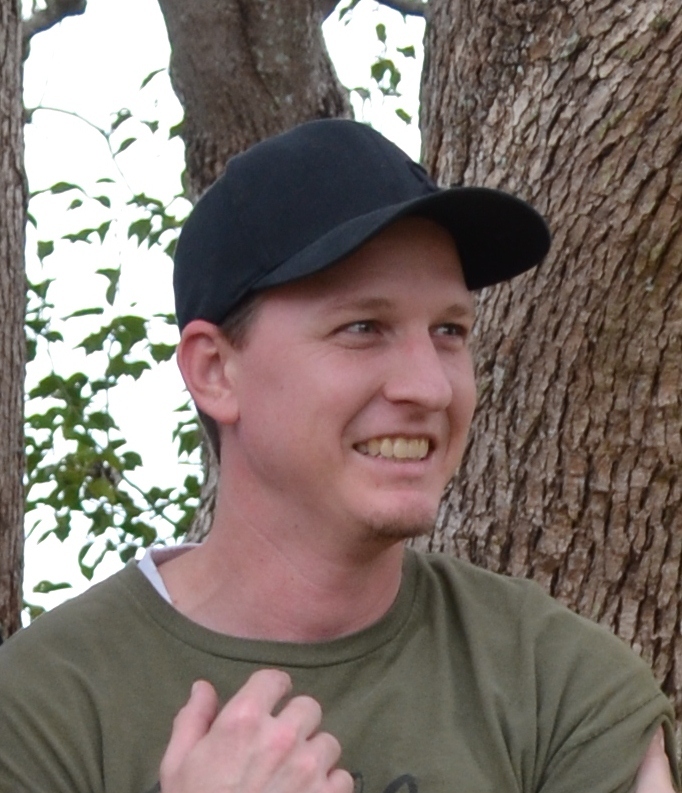 Our responsibilities include campsite and firepit cleaning, landscaping, trimming oleander and some of the other trees throughout the campground as well as trash pickup throughout the NPS areas in and around Echo Bay. There are several areas along a 20 mile stretch of road where we will work during our 2 month stay including Rogers Springs, Blue Point Springs, Redstone, Stewarts Point and St Thomas. Both campgrounds are landscaped with oleander bushes as ‘dividers’ between the individual campsites…..and they need lots of pruning. 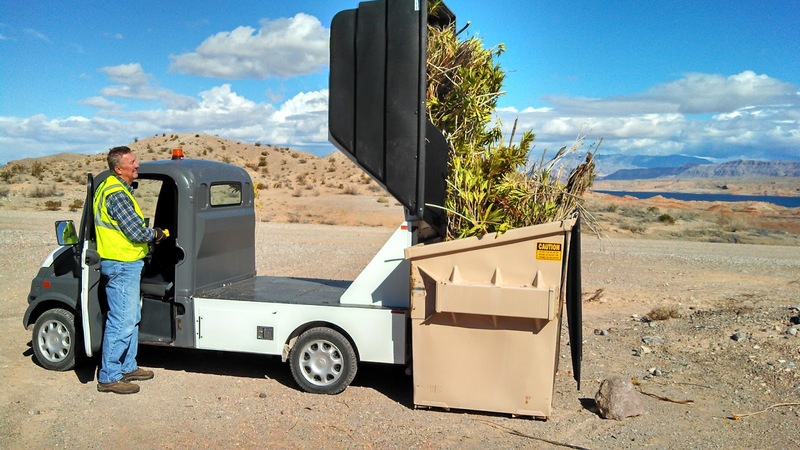 We have access to a vehicle called a MEGA; a combination electric golf cart and dumptruck. As you can see it comes in handy with the cleanup after the trimming is done. 3 Bald Eagles and 1 Golden Eagle (sorry, no pics as we weren't fast enough with the cameras), however we were able to get this pic of bighorn sheep. There were 2 unfortunate sightings: the first was a slow moving homo sapien in an old Infinity driving anywhere from 15 to 35 mph for a stretch of 16 miles before he pulled over to answer natures’ call. He was fortunately apprehended by the local law enforcement officer a few minutes later before anyone or anything was caught in his grill; the second was one of the park’s wild donkeys who decided to take a midnight stroll along the highway where he encountered a small import. Neither he nor the import survived (the driver was medivac’d out). A couple of days ago we had occasion to leave the park and when we returned we met one of the NPS employees working the entrance gate; Heather. We introduced ourselves and started asking questions about trails we could hike or take the jeep on. She discovered they were out of maps, but promised to pick some up next time she was in town at the office. A couple days later we were working in the campground and who should stop by…..Heather, with copies of maps for several of the areas around Lake Mead showing mile markers, trails and back country roads we could explore. Thanks Heather. This is a common theme we've discovered in talking with National Park Service employees; they are really interested in helping people explore, discover and enjoy their parks and they go out of their way to help. 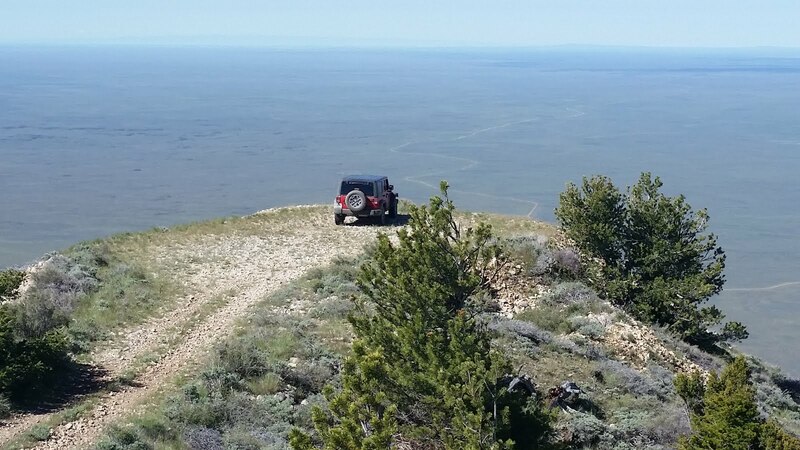 We've taken the jeep out for a couple more off-road excursions. It’s been interesting seeing the desert away from the paved roads. Generally we’re driving through washes, with occasional climbs across barren rock and through rocky routes when we get into the higher elevations. One side effect…..the jeep is really dirty. 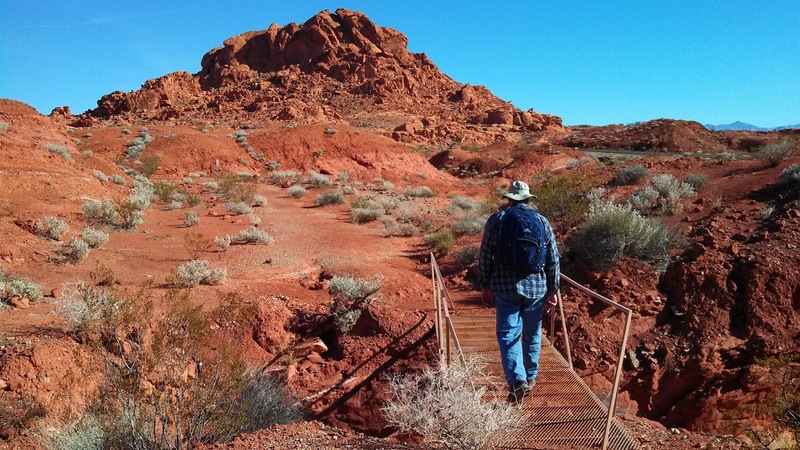 We've also taken a couple of hikes; a short hike to investigate Rattlesnake Wash and a supposed pool where you can swim; and a 1.5 mile hike just inside Valley of Fire. Sunday we drove into Vegas to Main Street Station. For those of you in Florida it's just like Church Street Station and I think it was built by the same person (Bob Snow). The reason we went was to meet Joan's cousin Theresa and her husband Brian, uncle Bobby and aunt Georgia. We had dinner, then Bobby took us on a short 'inside' tour of Freemont St and surrounding casinos. We made it back to Vegas on Thursday(10th)….7 days, 2600 miles, 5 hotels, 8 McDonalds' sweet tea stops, 1 detour to Carlsbad Caverns, and 12 friends well-met and visited with along the way! All in all it was a great trip back to Florida for the holidays, but we are glad to be home in the RV. 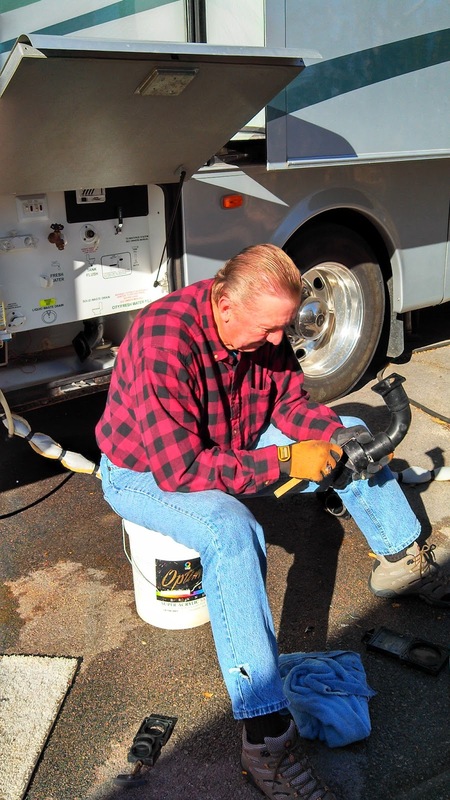 We took a few days and just relaxed, then took care of a few maintenance issues such as replacing the black tank valve in the water bay and getting our Dish Network/Winegard Antennae properly hooked up and working. We spent a week in Duck Creek RV Park before relocating to Echo Bay in Lake Mead National Recreation Area. We set up in the upper campground and met our supervisor Tim and co-worker Marty. 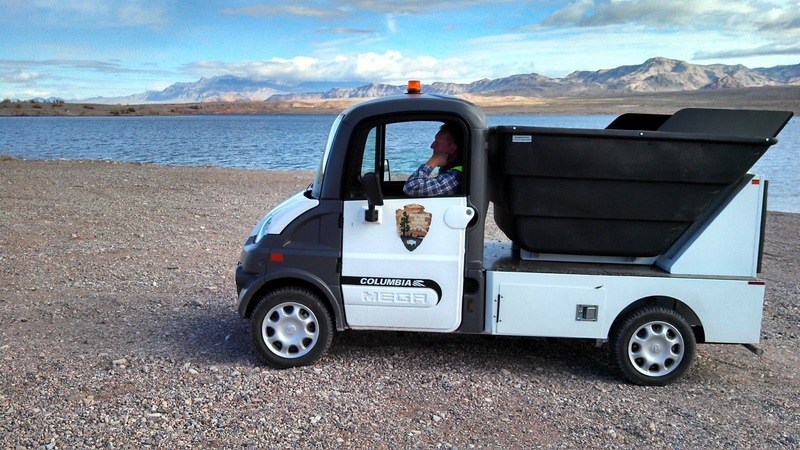 We’ll be working in Lake Mead National Recreation Area until the end of March. On Saturday we decided to take the ‘new’ jeep out for its inaugural off-road trip. Our supervisor had marked up a park map identifying some good off-road routes, so off we went. We decided to take a short 3-4 mile route down Echo Wash. Everything started out fine with some sandy and loose gravel river beds as our main track. Then the route ventured off into the desert as the wash was marked as Wilderness Area – No Motorized Vehicles. About 2 miles out we came to the first intersection and I decided to go straight rather than turn left…back to the main road. After all we were having fun! And the next thing you know it was Gilligan’s Island all over again. Yep, what started as a 3-hour tour looked as though we could be lost for an indefinite period of time. I owned 2 jeeps in the late 70’s early 80’s. And have spent a little time off-road in Florida. Nice flat Florida. Nice flat sandy Florida. Nice flat sandy close to something no matter where you are Florida. I have not however spent any time off-roading where it’s rocky…or where it’s hilly…or where it’s desert…or where it’s miles and miles and miles to anywhere. It’s a lot different. About 10 miles in we had a chance to turn around and head back. We had passed 2 other jeeps and a motorcycle. According to the biker we had 1 spot left that was a little rocky…..then it would be smooth sailing for the remaining 10 miles….if the road hadn’t changed in the last 2 years since he had traveled it. So we decided to keep going. We found the rocky spot and after walking it decided we would give it a try. We made it with a little extra effort and locking the jeep in 4Wheel Low. By now we had been out for about 3 hours and were only a little over half way through the trail. About an hour later we made a turn that dead-ended a mile later. We backtracked and got back on what we thought was the correct trail to what appeared to be a little used track. A few miles later we found ourselves with a steep down-hill grade with numerous solid rock outcrops. We still weren't sure if we were on the correct track at this point. We had just turned around again when a couple of ATV’s came by. They told us we were only 3 miles from the end of the trail, with only a couple of ‘iffy’ spots along the way. So on we went. Through the ‘iffy’ spots ( I was glad the ATVs’ would be coming this way just in case) and found the dirt road. 4 more miles and low and behold it was pavement….for the first time in what seemed like forever. The jeep did great. 20 miles across the desert without a hitch. I on the other hand need to be better prepared next time. 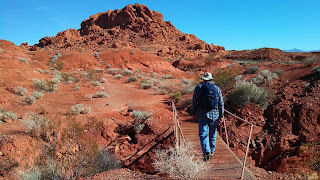 We took the road through Valley of Fire State Park and saw some great red stone mountains and formations. A quick hike to Mouse’s Tank and we even managed to see some petroglyphs. Then it was about 15 miles back home. We were both tired and hungry, so we settled in for the night. Tomorrow we’re planning a quick trip back into Vegas on the bikes to charge up the batteries. So here we are on our way 'home'. It didn't take Joan or I very long to figure out that the motorhome is now our home; in our heads and in our hearts. We left Vegas on Saturday 11/17 headed for what used to be home; Florida. We stopped in Alabama and Atlanta along the way to visit family for Thanksgiving. And we spent 5 weeks in Florida visiting family and friends before heading back to pick up the MH and start our next workamping gig. And as much as we love our family and thoroughly enjoyed catching up with our friends; we missed being home. When we left Vegas we thought we might spend as long as 2 months in Florida. That idea continued to 'morph' the longer we were gone. By the time we left Florida we could barely think about eating out again. And as we get closer to home we're both of the opinion that next year's visit to Florida for the holidays will be a shorter version. Joan and I made a couple of changes while we were in Florida. The first change was to switch our cell service. 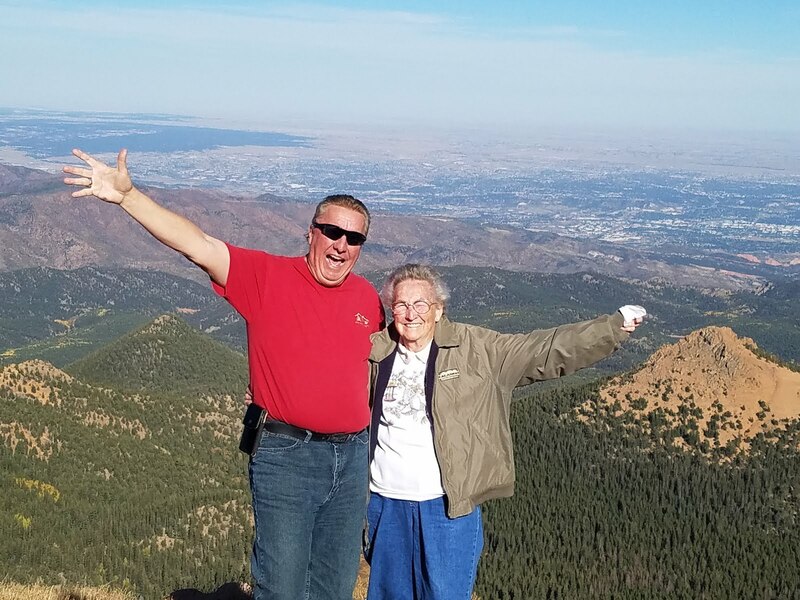 We had determined that our previous carrier did not have good coverage in the mountains of Colorado where we will be working this summer; based on our research and feedback from other workampers we selected Verizon as our new carrier. The second change was to trade our car for something that would allow us to explore a little further out into the country and mountains than a standard car. We ended up buying a Jeep Grand Cherokee 4x4. We've always enjoyed taking the car for drives and while we were in Oregon last summer our attempts to explore were continually being thwarted by roads that turned from asphalt to gravel to impassable for standard vehicles. We hope to really get off the beaten track this year. We had a great Christmas and New Years. We also had some adventure. While we were in Florida there were times when we needed additional transportation as Joan and I would be going in different directions. The week before Christmas Joan borrowed her sister's F-250 4x4. It was being underutilized and everyone thought it would be a good idea for it to be driven. Our car was parked on the street and the truck was parked in the driveway at Jim & Deb's. Deb had gone out early for breakfast with friends and when she returned Joan apologized for blocking her car in the garage. "I wasn't blocked" replied Deb. "Yes you were; I was parked behind you in the driveway" said Joan. "No, nothing was behind me" said Deb. Everyone rushed outside to discover the truck had been stolen. According to the police, that particular vehicle is the vehicle of choice for crooks needing a vehicle to 'do a job'. The truck can hold your entire crew; is easy to break into and hotwire without any alarm going off; and can pretty much go anywhere, including through doors or walls that might be hampering the crooks ability to take whatever they want. The police also stated they had probably already done their dirty deed and abandoned the truck before we realized it was gone. Sure enough, Joan's brother (retired corrections officer) made a few calls, drove around for a couple of hours and found the truck abandoned in an apartment complex parking lot. 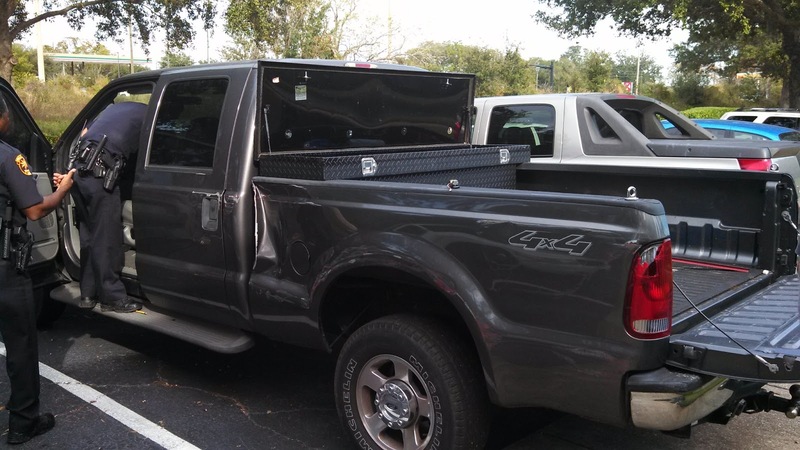 The truck had been driven less than 10 miles from where it was stolen. 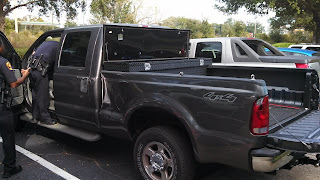 The crooks had apparently used the truck to crash through a wall (damage to the truck bed and red paint along the sides of the bed and doors) then steal some sort of safe (the door to a safe was found in the truck bed). The truck is in the repair shop and will be as good as new in a few weeks. One side affect....Joan has been getting all kinds of calls from different folks asking if she would be interested in driving their unwanted cars. Just before we left Florida we met up with Al and Karen (Wish Upon an RV Star!). They had the job last summer that we will have this summer. 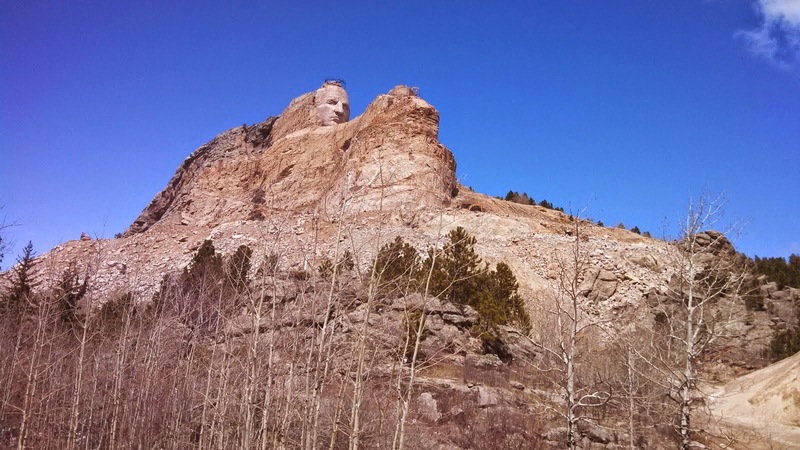 After following their blog last year we were very interested in working in Colorado. When they announced that they would not be returning to Chalk Creek this year we immediately contacted them to ask questions. We subsequently submitted our resumes and were offered the camphost positions they vacated. We met for breakfast and ended up talking for over 2 hours. Flash forward a couple of days and as we were driving west through Texas Joan realized that Rudy and Phil (Workin' RVers) were also traveling in the same area. She called them and we determined we were only a couple of hours behind them on the interstate. We made arrangements to meet them the next day and spent 3 hours discussing workamping, Amazon and future plans. 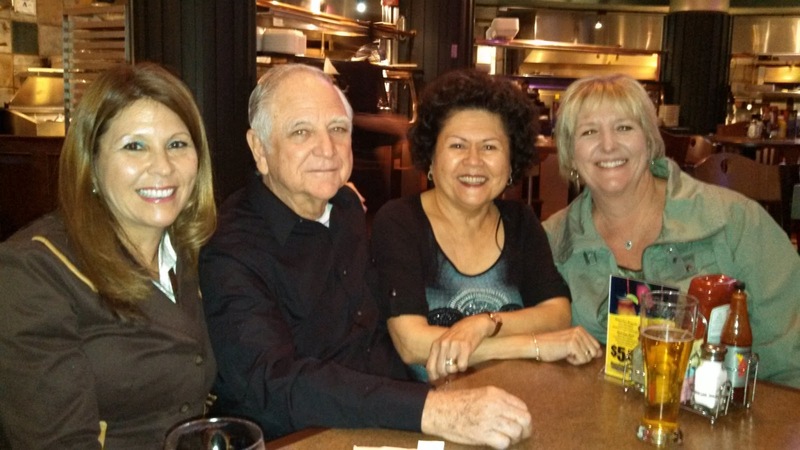 We stayed 2 nights in Phoenix and managed to meet up with some co-workers from Oregon; Larry and Jean. And we met with Dave and Maxine (Wandering Wingers). Several friends and family have asked if Joan and I get lonely being so far away from Florida and the people we've known our entire lives. We have to tell them 'No'. We have met so many new people this year that we now call friends. And being able to travel across the US and meet up with so many of them along the way reinforces with us what a good decision we made to go fulltime. While driving through Texas we took a slight detour into New Mexico to visit Carlsbad Caverns. We had plenty of time and decided to take the walking path down into the natural entrance rather than the elevator. The pathway into the caverns is 1 mile and drops 700 feet. Once in the caverns there is a 1.25 mile path in and around the caverns and formations. Then we took the elevator back to the surface. Needless to say we have been feeling the steepness of that hike over the last few days. Our plan from here is to travel to Yuma where we hope to catch up with more Oregonian co-workers Don & Donna, Mel & Teri and Phyllis & Gerry before finally making it to Vegas this weekend. Once there we will catch up with our supervisor from Lake Mead Recreation area and start our volunteer position which will carry us through March. That's about it for now. Stay Tuned. More to Come.